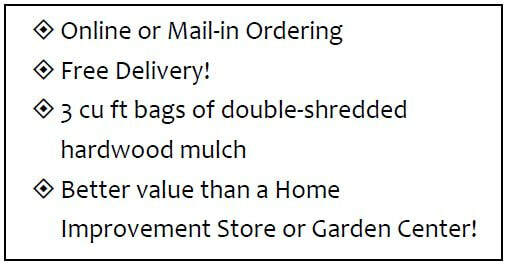 Troop 1028 (boys) and Troop 1029 (girls) are raising funds by selling high-quality, double-shredded, natural color Hardwood Mulch in 3 cubic foot (50 pound) bags with FREE delivery and stacking! Please see the delivery area notes below. 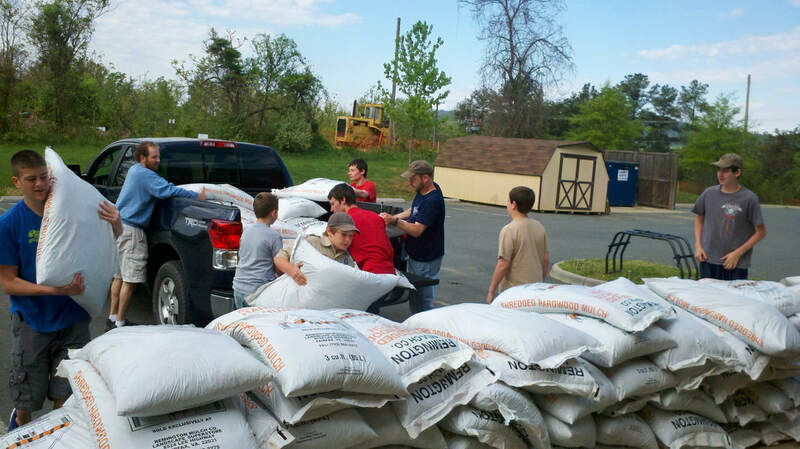 The proceeds of our Spring Mulch Sale are given back to individual Scouts so that they can go to summer camp, pay for camp gear and equipment, and to cover other activity fees. We encourage each Scout to earn their own way and your participation in our mulch sale will help them do just that! Our Spring 2019 Mulch Sales are now OPEN ! ​Your order will be delivered to your driveway on Saturday April 27th or Sunday April 28th, 2019 ! 3 cubic foot (50 pound) bag, with free delivery! All orders must be received by April 16th, 2019! ​Call us for any last-minute orders or special delivery instructions. IT IS EASY TO ORDER: Order online by clicking the Buy Now button below. Payments are securely processed through PayPal and you can pay with a major credit card or PayPal. Place your order for as many bags as you would like (please be sure to hit "Continue" after you select your quantity). ​If you prefer, you can also buy directly from any Scout in Troop 1028 or Troop 1029 or you can mail in your order along with a check payable to "Troop 1028" by using the order form below (pdf). If you do mail in your order, please also send us an email so we don't miss your order if you are close to the deadline. Delivery Notes: Delivery preferred to Mill Creek, Mill Creek South, Lake Reynovia, Foxcroft, Redfields, Mosby Mountain, Cherry Hill, Hessian Hills, Johnson Village, Willoughby, Dunlora, Woodbrook, Northfields, Still Meadows, Carrsbrook and other select neighborhoods. If you are outside of listed areas, please call or email to make sure that we can deliver. THANK YOU FOR SUPPORTING OUR SCOUTS !! Here is a link to open an external mulch calculator in a new window, you enter the surface area in square feet to be covered (you can calculate this by multiplying the bed width in feet by the bed length in feet) and the desired mulch depth and it will return the required number of bags (use 3 cubic foot bags when reading the answer). If you are covering multiple beds, you can calculate each one separately to keep it easy, and just add up the totals. Remember to round the total number of bags UP to maintain the desired mulch depth.